It is difficult to overestimate the importance of silicon when it comes to computing, solar energy, and other technological applications - not to mention the fact that it is the second-most abundant element in Earth’s crust, in terms of mass percent. The most common form of silicon crystallizes in the same structure as diamond (Si-I), but other allotropes can be created using different processing techniques. 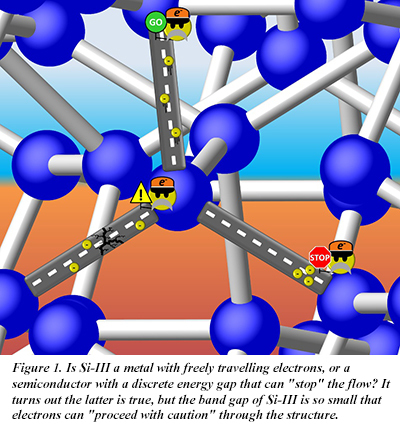 New work that involved Haidong Zhang and Zhenxian Liu, both now in the School of Engineering and Applied Scienceat George Washington University, and Tim Strobel at Carnegie shows that the Si-III (or BC8) phase, which is formed at high pressure, is a narrow band gap semiconductor. The Si-I phase is a semiconductor and other known forms are metals, but the properties of Si-III have have not been measured accurately until now. Previous experimental and theoretical research has suggested that Si-III is a poorly conducting metal, but due to the lack of sufficiently pure and sufficiently large crystals, the theoretical predictions have been difficult to verify experimentally. ​Lead scientist Haidong Zhang synthesized pure, bulk samples of Si-III synthesized with a large volume press technique, accurate measurements of the electronic properties of the material are now possible. Key measurements of the far-IR spectrum performed at the NSLS by Zhenxian Liu show that Si-III is actually a semiconductor with a band gap of 30 meV. First-principles calculations reveal a direct band gap, in contrast to diamond-like silicon, which has an indirect band gap that is much larger, at 1.1 eV. This suggests that Si-III could have uses beyond the many applications in which diamond-like silicon is currently used. The work was also supported by EFree (DOE-SC) and COMPRES (NSF) [H. Zhang et al., Phys. Rev. Lett. 118, 146601 (2017)].